Our 10 Favorite Prom Jewelry Pieces for Less Than 50$! We all know that prom is a significant milestone for any girl. It often marks the end of senior year and the beginning of the next chapter in our lives. It’s a celebration and an opportunity to get together with friends and share in each other’s success as we plan for the future. And most importantly, it’s THE opportunity to get the perfect prom dress and all the right accessories! What jewelry will I need for my prom? This is it! You’ve been waiting for a long time for prom to come around and it’s finally here. You have your prom dress, you have your shoes, your hair is all booked in for the day before, but what about jewelry? Well, the jewelry you choose to wear really has to come down to your taste and what you feel most comfortable wearing. There are a few things to think about when you’re looking at jewelry. You might want to start with your dress and use that to set the theme for your colors. For example if you’re wearing a blue dress, you might want to pick out some blue in your earrings and in a necklace to complement one another. Be careful though. Too much of a single color could make it a bit too much so you’ll probably want to have a bit of a dress rehearsal beforehand to try everything on together and check that it all goes together. In terms of which items of jewelry to choose, the most obvious are earrings. Earrings can easily be matched with your dress to pull your outfit together. Consider whether you want small stud earrings, or alternatively whether you’d like to wear longer dangly earrings. Next you’re probably going to want to try a necklace. It’s not always needed but if you do go for a necklace try to match it with your earrings as this can really help to pull everything together. There are some fantastic earring and necklace sets available that you might want to consider and the great thing with this is that you won’t have to spend too long trying to find a necklace to match your earrings. Next you might want to consider something for your hair. Hair combs are becoming increasingly more popular (don’t worry, we’ll come on to them later!) and you can also match the color of your hair comb to your earrings or necklace. Alternatively you might want to consider a tiara which can again be matched with your earrings. You may also be thinking about wearing a ring that you can match your outfit and there is a range of beautiful rings available that can really help to show off a prom dress. Similarly, bracelets and bangles can help to further complement a look and finish off your outfit. 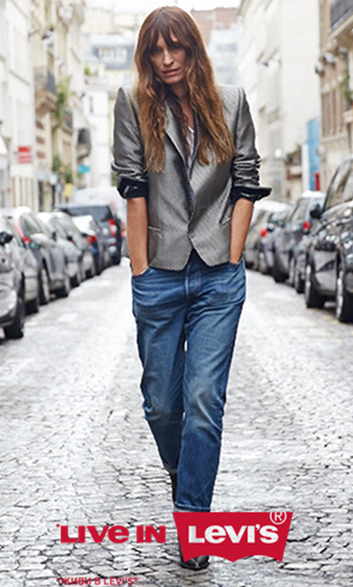 You may decide that you want to take a more minimalistic route with your outfit and have just one accessory. 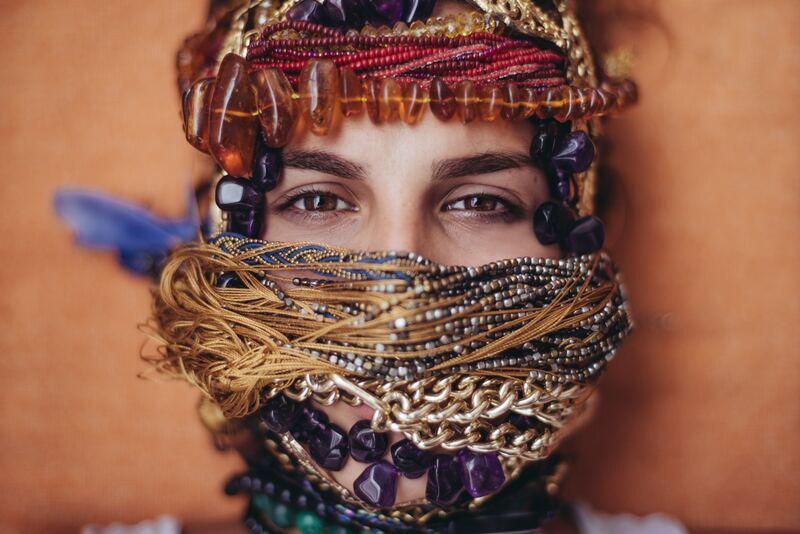 That’s fine – it’s important that you feel comfortable with what you are wearing and to be honest, you don’t want to overdo it with accessories! Either way, whether you’re looking for something simple to finish of your prom outfit or you’re looking for a selection of items, our top 10 list of prom jewellery will give you some options to get you started! Your prom is the perfect opportunity to dress up in your finest gown and wear a range of accessories to help you celebrate in style. 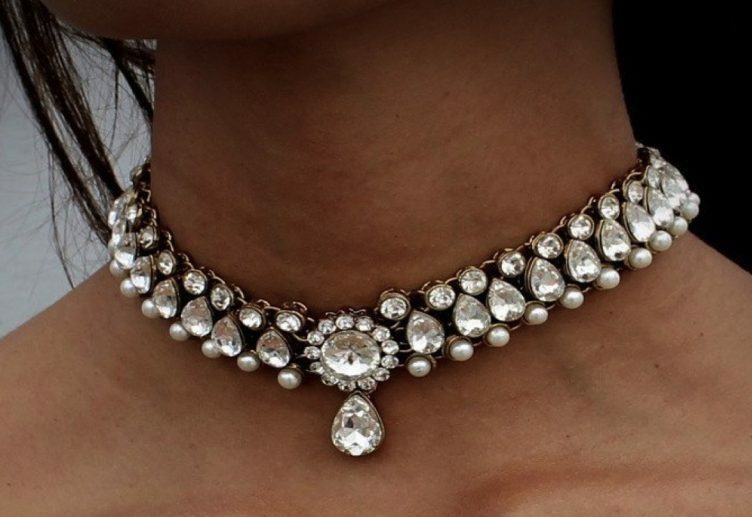 One item of jewelry which is certainly a beautiful item to complement any prom dress is this elegant choker necklace. Made from silver plated alloy, you can see straight away that this is a really glitzy item of jewelry that will catch people’s attention. 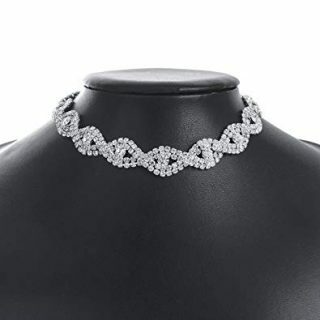 The designers of this choker have chosen an infinity design which sees this gem studded necklace effortlessly intertwine to create a stunning item of jewelry. In terms of length, this choker is 11.3 inches long however the designers have cleverly included a 3 inch extension to the necklace which means that you can adjust the choker depending on how tight or loose you prefer. Another benefit with having an extendible necklace is that if you are buying this as a gift then you won’t have to worry if you are unsure of the recipient’s neck size. The gems in this choker really do sparkle and the great thing about them being light in color is that they will match with almost any dress. Our advice would also be to think about the earrings that you are planning on wearing and maybe even look to tie the chocker and earrings in with your hair clip. Either way, this is a stunning item that will certainly make your outfit. You can rest assured that your choker will arrive safely as it will come in its very own gift box. Furthermore if you’re not happy with the necklace when it arrives, there is a 30 day money back guarantee. But we’re sure that you will love this stunning item of jewellery! The seller of this item even offers a lifetime guarantee which we are very impressed with as this is such a reasonably priced item. What prom dress would be complete without a stunning pair of earrings? And these earrings are very elegant! 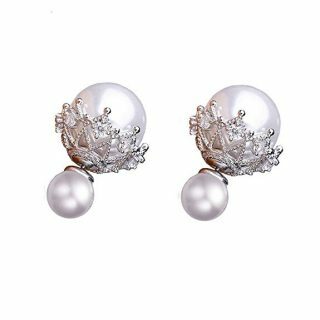 These pearl stud earrings offer the ultimate understated look and due to the clean and crisp look they can be matched with a range of styles and dresses which gives you great flexibility. The pearls on these earrings are beautiful on their own but what makes them extremely pretty is the design that frames the studs. The design around the pearls is silver in colour and reminds us of a crisp winter’s day. This design works really well with the pearls which have been buffed to a sparkly shine. Perhaps our favorite part of these earrings though is the elegantly placed zirconia gemstones that are positioned on the decorative frame around the pearls. This is a really well chosen gemstone which gives the earrings that extra sparkle by catching light extremely well. 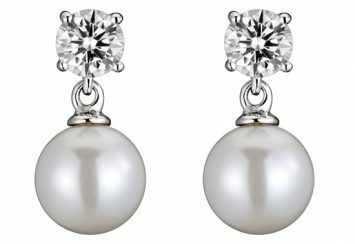 When we first looked at these earrings we didn’t actually spot the zirconia gems, however it wasn’t long before we saw the glistening white gems which are the perfect pairing for the smooth white pearls. You’ll also notice that the backs are rather special. Rather than the standard butterfly clasp that most earrings contain, these actually have another pearl on the back. This level of detail is very impressive and gives it a really classy feel. You might even get away with reversing the earrings so that the smaller pearl is on the front of your ear. However we recommend keeping them the right way around so that you can admire them in all their glory! 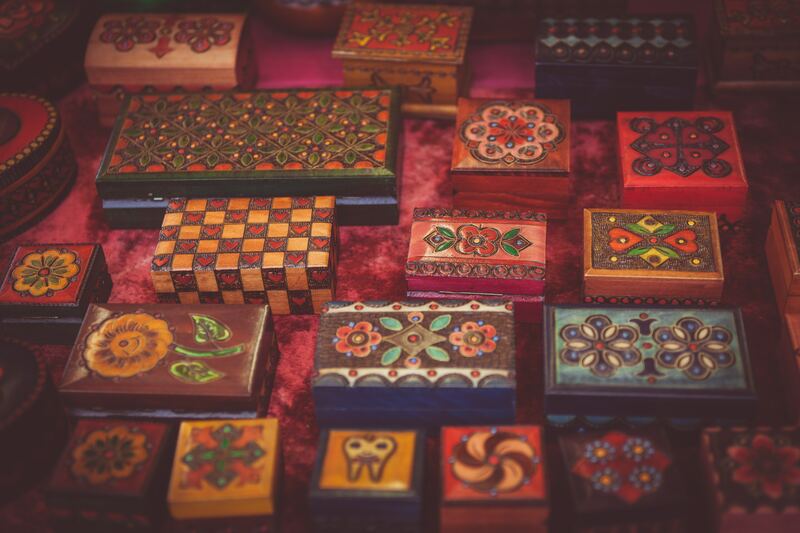 Your earrings will come in their very own jewellery box to keep them safe which is very handy (we all know what it’s like when one earring goes missing!). Another great thing is that because they are a simple and elegant design, you’ll be able to wear them again after your prom and they will be suitable for almost any occasion. That’s what we love, a bargain price and something that you can wear over and over again! We’ve already said that your prom is the perfect occasion on which to go all out with your accessories. One item that you might not have thought about yet is a hair comb. But fear not, we have the perfect hair comb to complete your prom outfit! 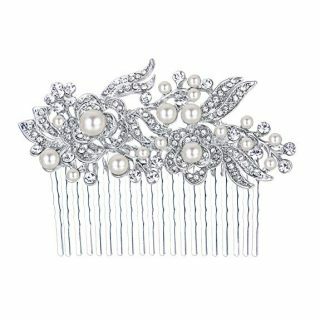 This Austrian Crystal Cream hair comb is created in a flower leaf vine design and includes a number of stunning simulated pearls and smaller gemstones. This really is a pretty piece of jewelry that has some extremely intricate detail in the design. For this review we’ve focused on the clear silver toned design as we think this is the perfect option to match with your dress no matter what the colour or design. However there is a range of other colors available including blue-gold, blue-rose gold, gold, red-silver and purple-silver. What we really like on the blue, purple and red designs is how the smaller pearls have been replaced for colored gemstones that can be matched with the color of your dress. This is really clever and gives a feel of a rose studded bush that is very pretty. Our favourite though has to be the clear-silver tone as we just love all of those pearls and clear gems! If you’ve never worn a hair comb before, don’t worry! They can be very comfortable to wear and they are a great way to securely hold up your hair. They are also a great way to brighten up your hair, particularly if you are planning to wear your hair in a loose bun. We think that hair combs are very sophisticated and this design in particular is beautiful and offers a really vintage glamour feel. The designers of this comb, Ever Faith, have done a great job and they even deliver your hair comb in its very own gift box and favour bag. We’re sure that you won’t be disappointed with this lovely item for your prom! 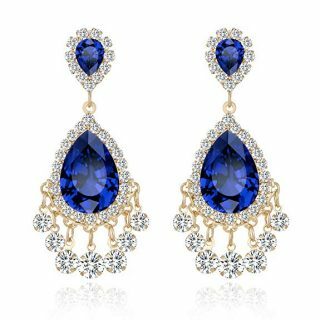 Some occasions call for something special to really show off your style and this crystal drop dangly blue earrings certainly do that! These earrings are made from alloy and they are either gold or silver plated depending on the design you choose. For this review we’ve gone for the gold plated design and matched them up with the deep blue gemstones which are matched perfectly with a range of smaller white gems. One of the great things about these earrings is that they are very light so although they look quite heavy they won’t hurt your ears. The designers have also confirmed that the metal used in these earrings is lead and nickel free so they are safe to wear if you suffer from any metal allergies. We love the design of these earrings. The tear drop design of the larger gemstones offers the perfect way in which to dangle the smaller gems underneath. It almost reminds us of a large, shiny chandelier that is the centrepiece of the ballroom! Although we’ve taken a look at the sparkly blue design, these earrings also come in a selection of other colours including black gold plated, champagne gold plated, green gold plated, pink gold plated, red gold plated, violet gold plated, white gold plated and white silver plated. Now that is a great selection of options! Your earrings will of course come in their own jewelry box and you have peace of mind due to the 30 day money back guarantee. These really are an attractive piece of jewellery that is sure to give that wow factor to your prom outfit! What would a prom outfit be without a tiara? This gold tiara offers sparkle, sparkle and even more sparkle! One thing that we’ve always worried about with tiaras is that they might fall out part way through the evening. But that won’t be a problem with this item as it includes a comb on each side to hold it steadily in place. When we first saw this tiara we instantly thought about Wonder Woman and her iconic gold tiara (although without the diamonds!) so we knew this had to be in our top 10 list. The tiara is made from copper which means it is suitably weighted to wear and without feeling too heavy. Another great feature with this item is that it is expandable so can be adjusted to fit your head. This is really important as head size can vary so much between each person, so it’s good to know that you will be able to adjust to being a perfect fit. 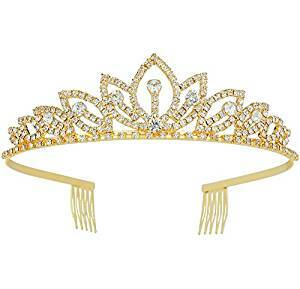 The design of this tiara is very attractive and the gold coloured metal is covered in Rhinestone crystals (these are essentially imitation diamonds). Some items of jewelry that use these gems can look a bit tacky however with this tiara we really like the look and feel. This may be in part due to the design which is really nice and simple and uses a classic leaf shaped design that moves away from the centre of the head piece. This is another example of an accessory that can be matched with a range of colours and styles. You may want to have a think about the other jewelry that you are wearing to your prom so that you can match it to the tiara, however as the gems are nice and light we’re sure that this will look great with most items of jewelry. Whatever you decide to match this with, we’re sure you will feel like Wonder Woman when you wear this! This statement piece of jewelry really has the wow factor! 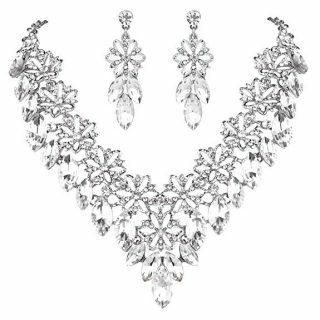 This set includes earrings and a matching necklace which are both sure to complement your outfit. Both the earrings and the necklace are made from an alloy which means that they are a comfortable weight, despite looking like a very heavy piece of jewelry. The main focus point for both the necklace and earrings is the trail of flowers which effortlessly flows around the necklace and includes a single flower on each earring. Petal shaped crystals adorn this necklace and smaller gems are positioned throughout, including in the centre of the flowers. This is a very clever use of the gems and adds even more sparkle to this glitzy necklace and earrings. A great feature with the necklace is that the chain can be adjusted from 21 to 24 inches which means that you can set the necklace to the length that you find most comfortable. The chain is also hidden at the back to some extent so that from the front you can only see the flower design. For our review we’ve chosen the clear-silver tone design however there is a wide selection of alternative colours available including blue topaz and gold, amethyst and gold, multi-colour and gold; and sapphire and gold. Our advice would be to match your dress to the colour you choose (or visa versa) and if in doubt choose the clear-silver tone as it will go with most dresses (and it’s gorgeous!). Your necklace and earrings will come in a beautiful presentation box that you can use to keep it safe and which also looks beautiful if you plan to give this to someone as a gift. This has to be one of our favourite prom items so far! 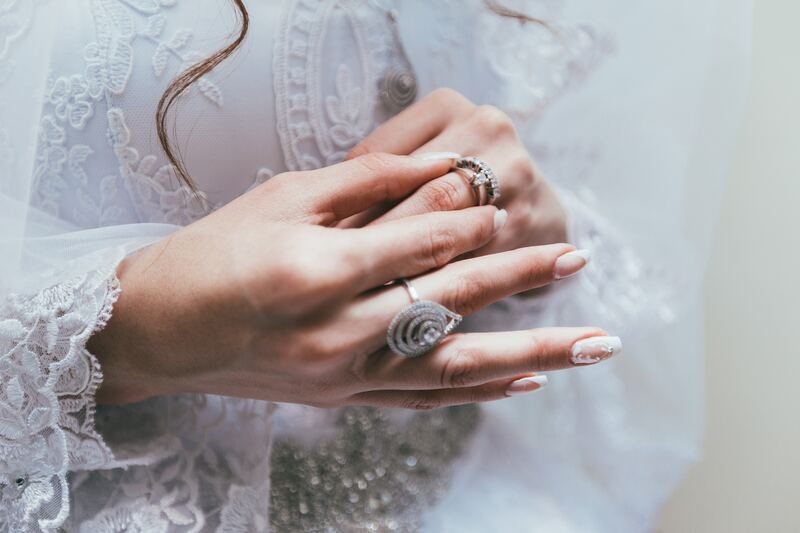 When you’re looking for jewelry to complement your prom outfit you may not initially think about hand jewelry however this is a growing trend and for good reason! This stunning hand cuff offers you a great way to add some sparkle to your outfit in a unique way. This hand cuff is hand crafted and includes a selection of beautiful cubic zirconia which has been set onto electroplated white gold. If you’ve never worn a cluster palm cuff before then it may take a little bit of time to get used to when you first put it on, however it won’t take you long to adjust. The great thing with this palm cuff is that it fits most hands and can be easily adjusted to fit the shape and size of your hand by simply bending the wire that fits between your fingers. This is another example of a piece of jewelry that can be easily matched to a range of other jewelry and styles due to its design. You’ll receive your palm cuff in its very own gift box to keep it safe and if for any reason you are unhappy, you have a 60 day money back guarantee (that’s double normal money back guarantee!). However we are certain that you’ll love this palm cuff as it will add the ultimate glitz and glamour to your outfit. This is a statement piece of jewellery! 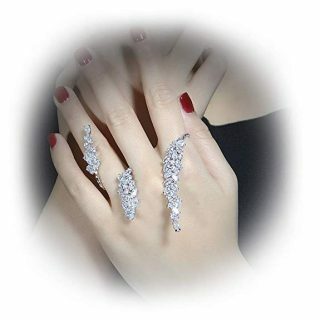 If you want a ring that will grab everyone’s attention and looks glamorous, then why not take a look at this sparkling butterfly ring. You’ll love it at first sight. Made from platinum plated metal, this stunning ring is an open ring that has been shaped like a butterfly and is covered in sparkling diamonds. One of the great things about this ring is that is has created using platinum plating which means it is very durable and won’t tarnish. This ring is also led and nickel free, making it safe to wear if you have sensitive skin. The great thing about this ring is that the unique butterfly shape will never go out of fashion. This style of ring would suit any hands, making it extremely versatile. This ring is also adjustable which again allows you to wear it on any finger by making it bigger or smaller depending on which finger you want to wear it on. When it comes to the structure of the ring, the inner section of the ring has a smooth surface which makes it comfortable to wear. 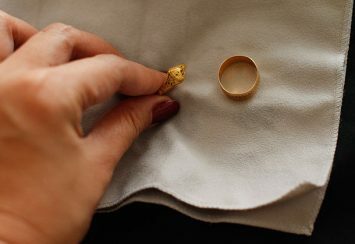 If the ring is slightly too tight it can be adjusted very easily and quickly. 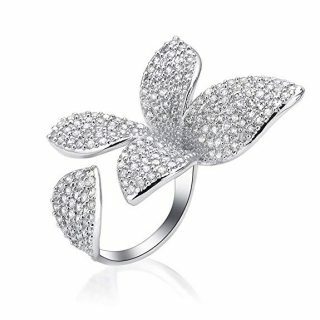 The butterfly ring has been created using cubic zirconia gemstones positioned securely in a pave setting. The silver gemstones have been cut into a round brilliant shape and when worn create a lovely sparkle across the surface of the ring which looks utterly gorgeous. If you’re curious about sizing, this ring is available in two sizes, the first of which is 1.54inches and the second 1.3inches. 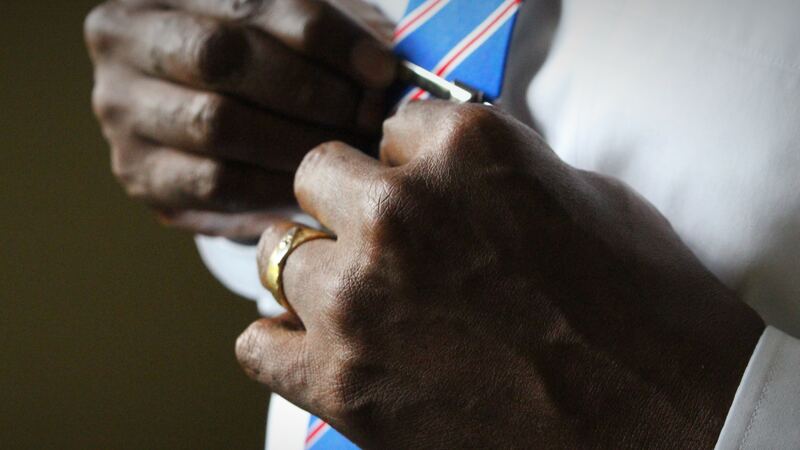 Interestingly, this ring can be worn as a two finger ring instead of one, which adds to is versatility and uniqueness. This stunning ring has been designed and created by dnswez who is a professional fashion jewellery brand. They love to make luxury but affordable statement pieces of jewellery. Their extensive range of jewellery includes brooches, earrings, rings, anklets, bracelets and necklaces. Take a look at their gorgeous collection today! We can’t get enough of the gorgeous Tennis Bracelet. This silver crystal bangle consists of shimmering diamonds mixed with deep blue gemstones. If you look closely at the blue gemstones, they could actually be mistaken for sapphires because of their color, shape and quality. The shimmering diamonds are actually sparkling cubic zirconia gemstones. These placed alongside the blue gemstones, complement one another and make this bracelet stand out beautifully. What’s great about this bracelet is that it has a smooth hollow back to it, making it extremely lightweight. 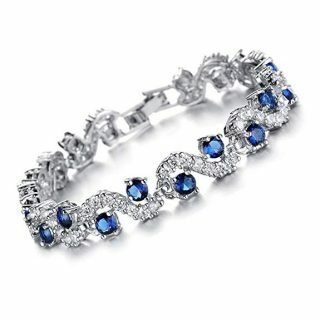 The blue and clear gemstones have also been mounted within this bracelet, giving them more of a defined look. The bracelet has been created with a beautiful shine to it. If you’ve got sensitive skin, there’s no need to worry when wearing this bracelet. This bangle is nickel and lead free, guaranteeing no more allergic reactions. If you’re curious about the size of this piece, the bangle is approximately 190mm in length and 8mm wide, making it a comfortable size to wear on your wrist. This beautiful accessory would brighten up any outfit, in particular a stunning prom dress. If you’re treating yourself to this piece of jewellery or buying it as a graduation present, the receiver will certainly be pleased with a sparkling and elegant bracelet like this. This stunning bracelet has been created by Feraco who make upmarket jewelry from stainless steel, titanium and crystals. Their goal is to create quality and trendy pieces of jewelry at an affordable piece. When it comes to attention to detail, these pieces have been handmade to the highest standard. 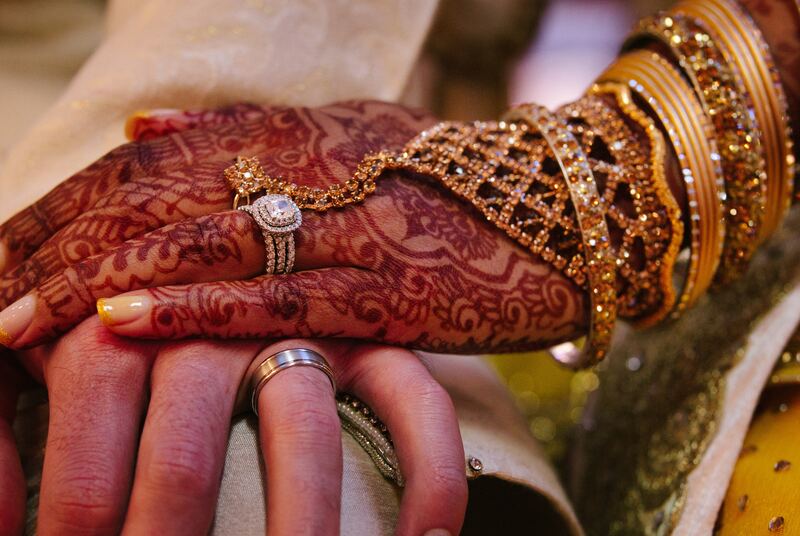 Every sparkling diamond has been secured by hand to ensure that they don’t catch on your clothing. Treat yourself to this gorgeous piece, you know you want to! 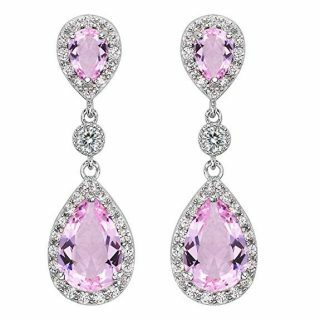 Every girl loves pink and dazzling diamonds, especially when they’re in the form of a pair of dangly earrings. This stunning pair of earrings has been designed by a jeweller, EleQueen who has done a fantastic job of creating a pretty accessory. This pair of earrings has been designed with a pink gemstone in the centre of the teardrop at both the top and bottom of these earrings. The pink gemstones have then been framed with dozens of shimmering clear crystals that add a touch of glamour to the accessory. This pretty duo has been made from a sterling silver metal and pink pear shaped cubic zirconia gemstone. The cubic zirconia gems have been held securely in place by a prong setting. When it comes to the shimmering crystals, these are clear cubic zirconia stones which have been shaped to a high quality cut. They also complement the pink colour gems beautifully. The size of the pear drop earrings are 1.4inches in length and 0.4inches wide. In total, this pair of earrings equates to 6 carats in weight. With a combination of sterling silver and colored gemstones, these earrings give off a high end polished finish which look very desirable. You can tell there is also a lot of attention to detail that has gone into these earrings. The great thing about these earrings is that they’re beautiful and robust but are also suitable for people to wear who have sensitive skin. If you love wearing personalized jewelry, then take a closer look at these earrings! You’ll notice that the colored gemstones symbolise the wearer’s birthstone. Even though these earrings are the perfect piece of jewelry to wear as part of your outfit to the prom, they would also be a great birthday present if you’re looking for a personalized gift. The jeweler offers a different colored jewel for each month of the year. If you take a closer look at EleQueen’s extensive collection of jewelry you’ll notice their particular love and passion for colored gemstones and shimmering diamonds. Necklaces, rings, bracelets and earrings – they’ve got it! Their jewellery design also includes delicate and dainty jewellery with a particular focus on heart shaped jewellery. Browse their collection and choose your favorites!